Unless you were present when your foundation was built, you probably don’t know what type of fill your contractor used to prepare your basement. In Maine as in most ls. places there are three primary fill materials. Crushed Stone, Compacted Sand, or Gravel. This is one of the first decisions the contractor makes in designing your house. It will also play a role in how much radon will be drawn from the soil beneath your home. Just to clarify: Compacted sand will have no rock or stone. It is pure sand filled to grade and then carefully compacted to be as solid and firm as possible. Gravel is a mixture of sand and stone. As a rule it is mostly sand. Crushed stone is all rock. Generally it has been sifted to a uniform size. The contractor will select the fill material on a basis of cost and site evaluation. Cost is one factor. Stone is more expensive than sand or gravel. However it requires much less work to make the material ready for concrete. Stone is always going to be the choice if the site has any chance of retaining water during the year. Because stone drains much more quickly than sand or gravel, there is much less risk that the home will have a water problem in the wet seasons of Spring and Fall. There are other benefits too. In our opinion stone fill below the slab in general tends to be a positive factor in overall indoor air quality. Precisely because it does not hold moisture as long as either sand or gravel there is less mold, bacteria, and mildew build up below the slab. Remember that in most untreated houses sub slab air is going to provide a fair percentage of the “make-up” which the house pulls in as it breathes. No builder wants to risk a water problem. It can ruin their investment as well as their reputation. However, if a new home is being built in an area where the surrounding soil is primarily sand and gravel such as we have here in coastal Maine and much of New Hampshire, then there is relatively little chance that water will stand even in the wettest season. Then the builder will quite legitimately select a less costly material for sub slab. Unfortunately what is good for water is bad for radon. This is almost a Mantra in our business. All drainage is empty space and the more empty space that is built into the structure increases the negative pressure exerted on the soil below. 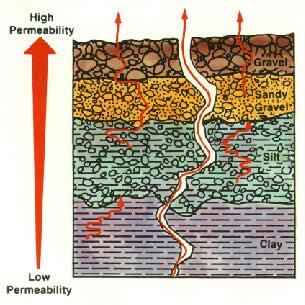 The more negative pressure exerted on the soil, the more radon is pulled towards the structure. This does not mean that crushed stone is to be avoided. A foundation that has crushed stone beneath the slab does tend to pull more radon towards the surface. However, all houses are going to attract some radon regardless of the fill material used. The air space between the stone will guaranty that any radon problem will be easily fixed with a simple single point radon system. A foundation that has only sand or gravel beneath the slab provides a more difficult challenge even if the initial readings are much lower. Because there is much less air space beneath a slab that has been poured on a base of sand or gravel, it is much more difficult to create and extend the pressure field required to collect the soil gases. A larger and more costly fan may be required. There will be more likelihood that multiple drops ( depressurization points ) will be needed.